The US Congress is very close to passing a significant Health Reform bill after months of debate, concessions and amendments. As this historical moment approaches, a minority of the American people are being very vocal with their apposition to this legislation. Teabaggers are protesting in Washington and elsewhere around the country, trying desperately to be heard. In many cases, their signs and words are outrageous and offensive, and of course this increases the coverage of their actions in the media. I must say that their tactics have been quite effective, because I have seen several photos and video clips featured in many print and TV news stories, despite their relatively small numbers in comparison to the overall population. Here is a shocking video shot by the Columbus Dispatch at a "Honk and Wave in Support of Health Care" event at Congresswoman Mary Jo Kilroy's district office. This video includes a segment where teabaggers mock and scorn an apparent Parkinson's victim telling him "he's in the wrong end of town to ask for handouts", calling him a communist and throwing money at him to "pay for his health care". This is exactly the type of rhetoric and hateful language that is echoed to one degree or another across the country. Most opponents of the health reform bill repeat the GOP talking point about spending "other peoples money" to provide health coverage for those who have no coverage. They like to make it sound like this health reform bill will take more money from the rich and middle class to pay for the poor. The GOP is also taking this opportunity to spread doom and gloom about the government takeover of Health Care. The National Republican Congressional Committee (NRCC) is posting this countdown ticker on various web sites and placing it as a paid political ad in the middle of news stories on the Washington Post on-line edition. A recent opinion piece by Paul Krugman explains several of the popular myths about the health care reform bill. Krugman is a Professor of Economics and International Affairs at the Woodrow Wilson School of Public and International Affairs, Princeton University, Centenary Professor at the London School of Economics, and an op-ed columnist for The New York Times. He explains that if government funding and regulation of health care equals a takeover, then the takeover happened a long time ago. Medicare, Medicaid, and other government programs pay for about half of the nation's health costs already and private health insurance covers only about one third of health costs. The other third of health costs are paid out of pocket. The private health insurance is mostly provided by employers and is heavily subsidized by the government. The cost of private health care is very high because hospitals and doctors have to charge more to cover the treatment of uninsured patients who can't afford treatment. The expenses from uninsured patients is exactly what this bill is intended to address. The NRCC also produced this video entitled "90 Seconds to Gov't Run Healthcare". This video is labeled as "An explaination of the process Nancy Pelosi and Democrats are using to take away your healthcare." Yes, the RNCC are such morons, they can't even use a spell checker to get the correct spelling of the word "explaination". Thanks GOP for that extra bit of unintended humor! The substance of the video focuses mainly upon a legislative procedure known as the self-executing rule. There was talk that House Democrats might use this tactic to push through the Senate version of the health reform bill by voting not on the measure itself, but rather a "fixes package." This procedure is also known as "Deem and pass" or "Deamon Pass" as the radicals call it. Of course the GOP is calling foul, and saying that this strategy is unfair and potentially unconstitutional. Self-executing rules are not uncommon in the House. House Republican leaders used it 36 times between 2005 and 2006 and Democrats used it 49 times in 2007 and 2008, according to an article in Politico by Thomas Mann, a Brookings Institution congressional scholar. The National Post is reporting that "Democrats in the House of Representatives said on Saturday they had secured enough support to pass a sweeping healthcare overhaul and would dump a controversial plan to avoid a direct vote on the Senate bill." So, the GOP seems to have been successful with their fear-mongering about Deem and Pass being an unconstitutional tactic. The good news here is that the Democrats are claiming that they will actually bring this issue to a vote, and that should eliminate the possibility of the courts overturning this legislation on a technicality. CNN, the Christian Science Monitor and other news sources are reporting that the CBO projects that the final version of the health reform bill will cost $940 billion over the next ten years. By comparison the US will spend $5.73 Trillion for ten years of defense spending. And that's not including the wars in Iraq and Afghanistan. If you doubt these numbers, I explain this cost projection in more detail at the end of this blog post, but I quoted this figure to make a point. Republicans and Teabaggers are complaining about government takeover of health care and the enormous expense to taxpayers. I'll bet you would be hard pressed to find a member of the GOP that would complain about the defense spending projections. The DoD spending plan includes funding for troops deployed in more than 150 countries around the world, with more than 369,000 of its 1,379,551 active-duty troops serving outside the United States and its territories. 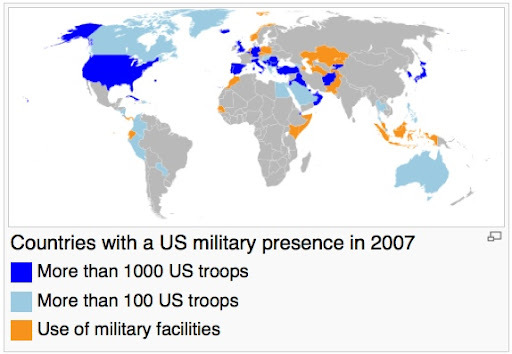 Many of these troops are still located at installations activated during the Cold War. See Wikipedia for these and more details. Why exactly is it so horrible to spend less than one fifth as much on health care reform as we will spend on defense? Why is it such a problem to save as many as 45,000 American lives per year? In case you aren't familiar with that number, Researchers from Harvard Medical School published a study that concluded that lack of health coverage can be tied to about 45,000 deaths a year in the United States. The study also found that people without health insurance had a 40 percent higher risk of death than those with private health insurance as a result of being unable to obtain necessary medical care. The risk appears to have increased since 1993, when a similar study found the risk of death was 25 percent greater for the uninsured. According to the Congressional Budget Office (CBO), "The federal budget is on an unsustainable path, primarily because of the rising cost of health care and the aging of the U.S. population." The CBO and the staff of the Joint Committee on Taxation (JCT) estimates that enacting both H.R. 3590 and the reconciliation proposal would produce a net reduction in federal deficits of $143 billion over the 2010–2019 period as result of changes in direct spending and revenues. The CBO also projects that this legislation would reduce the deficit by $1.3 trillion over the next two decades. And finally, as promised, here I will explain how I calculated the ten year cost of defense spending. A CBO estimate says that carrying out the Department of Defense's (DoD’s) plans would require defense resources averaging at least $573 billion annually from 2011 to 2028. This projection excludes overseas contingency operations (the wars in Iraq and Afghanistan and some much smaller military actions elsewhere. another CBO estimate says that under the Obama Administration’s plan, costs related directly to the U.S. forces conducting the war in Iraq, also called Operation Iraqi Freedom (OIF) would total $156 billion over the 2009-2014 period.